NEW YORK (AP) The Brooklyn Nets had heard enough about not being able to win on the second night of back-to-back games. Allen Crabbe was tired of hearing his defensive approach questioned. With the game on the line late in the fourth quarter on Monday night, they collectively answered. Rookie Jarrett Allen had a career-high 16 points, Crabbe added 15 points and blocked a potential tying shot, and the Nets edged the Orlando Magic 98-95. The Nets are 3-5 in the back end of a back-to-back. Aaron Gordon had 20 points and 12 rebounds, and Elfrid Payton added 17 points for an Orlando team that has lost its last seven games on the road. Bismack Biyombo posted his own double-double with 13 points and a season-high 17 boards for the Magic, who have now lost 11 of their last 12 overall. Crabbe made two free throws to give the Nets their three-point lead with 18 seconds left. He then followed it by blocking Evan Fournier’s 3-point attempt with seven seconds left, and DJ Augustin missed Orlando’s final chance to tie. The Magic led by as many as eight points in the first half, but couldn’t gain control of the game in a fourth quarter that featured 13 ties and 11 lead changes. Orlando squandered a 93-90 lead with 1:51 to go in the fourth after Gordon made a pair of free throws. Hollis-Jefferson then made two free throws to close the lead to 93-92 with 1:31 remaining and LeVert converted on a three-point play to put the Nets up 95-93. Orlando’s Wes Iwundu then answered with a basket to even it again at 95-all. Carroll was then fouled under the basket and put the Nets ahead for good. Magic: Orlando’s last road win took place Dec. 3 across town from Brooklyn at Madison Square Garden against the New York Knicks. Nets: Brooklyn, second in the league with 34.3 3-pointers per game this season, attempted only nine 3s in the first half, making three. They hit 6 of 15 in the second half . Nets lead the lead season series 2-1. The Magic welcome two of the NBA’s best teams this week at home. First up is a date on Wednesday night with the Houston Rockets, who own the second-best record in the Western Conference. Saturday night it’s a matchup against LeBron James and Cleveland, the defending Eastern Conference champs, who this week get point guard Isaiah Thomas back. Biyombo, who is averaging 9.5 points, 13 rebounds and 3.3 blocks since stepping into the starting lineup in place of injured center Nikola Vucevic, believes they can still snap out of this slump. ”We need to keep improving. We need to keep playing and we have to remain patient because there’s still a lot left in the season”, he said. The Nets improved to 9-0 this season when holding their opponent under 100 points. They’re also 7-0 when limiting the opposition’s shooting under 40 percent. 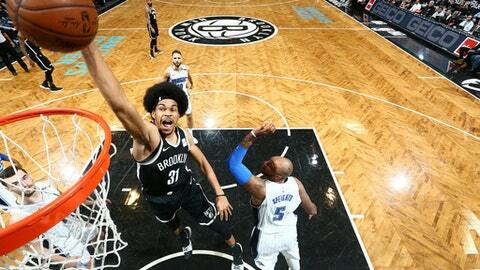 The Nets recorded a season-high 10 blocked shots. Crabbe had a career-high three rejections. Spencer Dinwiddie and Allen had two apiece. Magic: Host Houston on Wednesday. Nets: Host Minnesota on Wednesday.